Milan, 14th September 2010 – The Piaggio Group inaugurated Spazio Broletto 13, its boutique situated in the heart of Milan that will showcase all Group's products and brands. 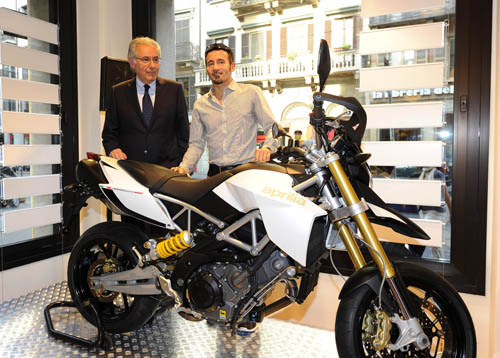 The presentation of Spazio Broletto 13 was held this afternoon with Roberto Colaninno, President and CEO of the Piaggio Group, and Max Biaggi, the 4-time world champion currently leading the Rider's and Manufacturer's standings of Superbike World Championship with the RSV4 of the Aprilia-Alitalia team in attendance. The official inauguration party will take place tonight. The Mayor of Milan, Mrs. Letizia Moratti will be among the guests. Guests at the store at via Broletto 13, today were also offered a preview of two new, top-notch models from the Moto Guzzi and Aprilia marques that will soon make their debut at the oncoming autumn winter shows(Intermot in Cologne, Germany in early October and Eicma in Milan in early November). 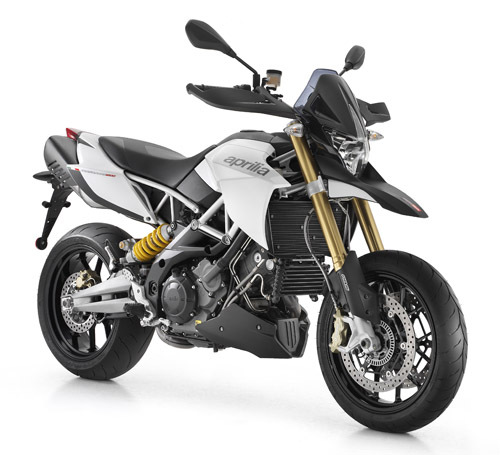 The Dorsoduro 1200 – with its all-new Aprilia 1200cc V-twin – is the ultimate evolution of the extraordinary Dorsoduro 750 maxi supermoto bike launched previously by Aprilia. The Moto Guzzi V7 Racer unveiled in Milan is the final version, ready for rollout in Italy and across Europe to after taking centre stage at the Milan Show 2009. The Moto Guzzi V7 Racer will be the focus of the inaugural week at Spazio Broletto 13. During the next few days, the group's new showroom will be dedicated to the legendary Eagle marque and to the latest addition to its renowned range of motorcycles. Two open days reserved for Moto Guzzi Dealers and Moto Guzzi Clubs, respectively, are planned on Wednesday 15 and Thursday 16. On Thursday 16, Spazio Broletto 13 will be open to the general public from 10:00 a.m. to 8:00 p.m.
APRILIA DORSODURO 1200 – With 277 GP wins, Aprilia is the most successful racing brand in the history of the Motorcycle World Championship. This season, it is leading both the rider's (with Max Biaggi) and the manufacturer's standings (with the RSV4) in the SBK World Championship and boasts 43 World Titles. 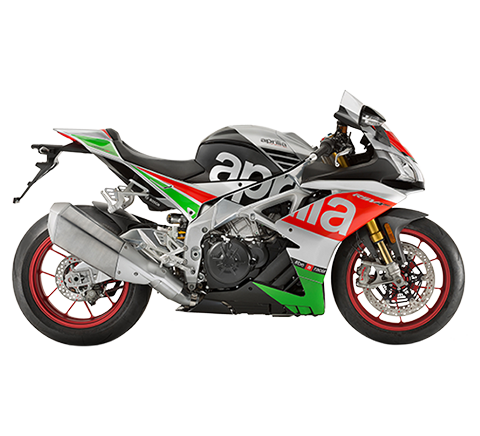 Building on unique expertise and skills gathered in the world of racing, Aprilia continues its development efforts on its large-capacity, high-performance range. The brand new Dorsoduro 1200 simply exudes class. 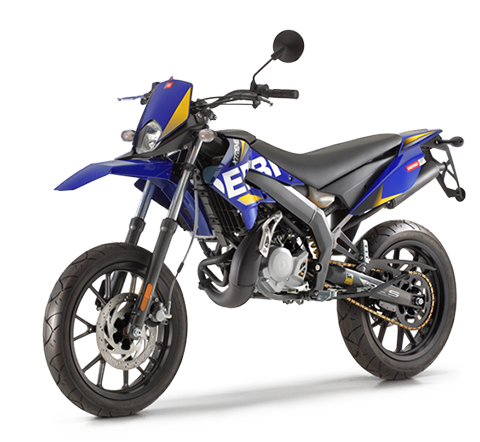 Offering superior performance and handling, the Aprilia maxi supermoto bike offers an exhilarating mix of power, agility and handling accuracy. The Dorsoduro 1200 sports a twin-cylinder engine with record-breaking performance cradled in a nimble, lightweight chassis – it's the brand new liquid-cooled 1200cc Aprilia V90 engine, with double overhead camshafts, four valves per cylinder, twin-spark ignition, and Ride-by-Wire fuel injection with three injection mappings that deliver just the right performance to suit road conditions and rider's requirements. 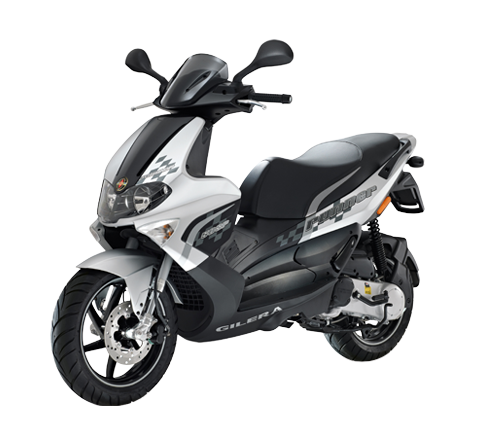 With its state-of-art sophisticated technology, the engine's power and torque delivery (130 HP at 8700 RPM and 115 Nm at 7200 RPM) is an undisputed record in the category and yet compliance with the most stringent Euro3 emission regulations is ensured. With this much power on tap, the benchmark chassis is up to task, sporting a hybrid steel trellis frame with aluminium side-plates, Sachs 43-mm upside down fork, gas-operated Sachs shock absorber with separate tank, Brembo braking system with 4-piston radial callipers and two 320-mm floating discs up front and 240-mm brake disc at the rear. 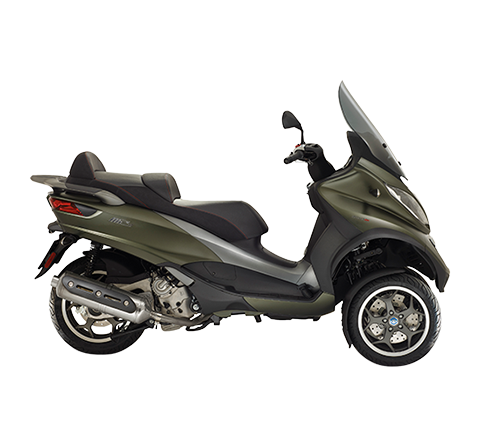 To offer the best in active safety technology, Dorsoduro 1200 is also available with ATC (Aprilia Traction Control) combined with two-channel ABS. Both systems can be disabled independently. MOTO GUZZI V7 RACER – Moto Guzzi V7 Racer is a true premodded stock bike inspired by the V7 Sport mods from the Seventies. Powered by the Moto Guzzi 750cc cardan-drive twin-cylinder engine the V7 Racer celebrates Moto Guzzi's traditional styling elements in a savvy mix of technology and exquisite craftsmanship. Its eye-catching details, like the chromed tank embellished with an elegant leather strap, or the colour-matched frame and Moto Guzzi logo and the logo's metal accents are sure to get attention. 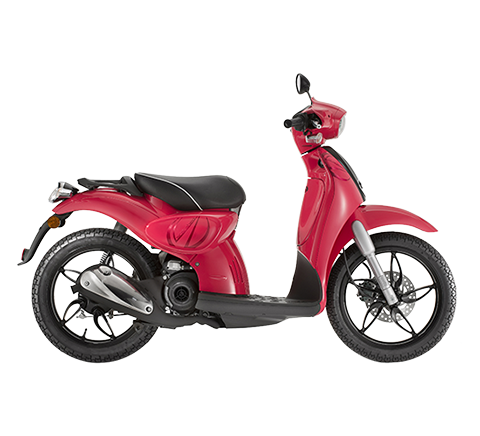 The red frame is inspired by the chrome-moly frame of one of the early, legendary V7 Sports' from the Seventies. Wheel hubs and swingarm sport the same red special paint finish. 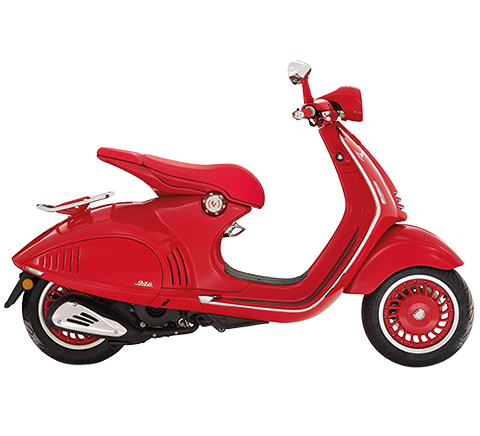 The sporty chamois-leather single-seat saddle, windshield and lean tail fairing with integrated race number holders lend the bike a very seventies look. Other pluses are the adjustable set-back billet footrests, the lightweight steering stem and the steering yoke guard. Technically speaking, the V7 Racer offers such sophisticated components as dual Bitubo gas-operated shock absorbers and 40-mm Marzocchi fork with dust boots. 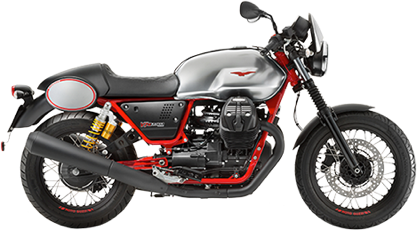 The Moto Guzzi V7 Racer retails at € 9,290 on the Italian market (VAT included, delivery at the dealer's). For the die-hardiest Aprilia fans, a “V7 Racer Legend Package” with dedicated arrow pipes, customised “V7 Racer” jet helmet, V7 Racer photo monograph, free membership in Moto Guzzi World Club and VIP Hospitality access to the Imola 200 Mile Revival (in the 1st-3rd October period, offer valid for purchases until 30th September). 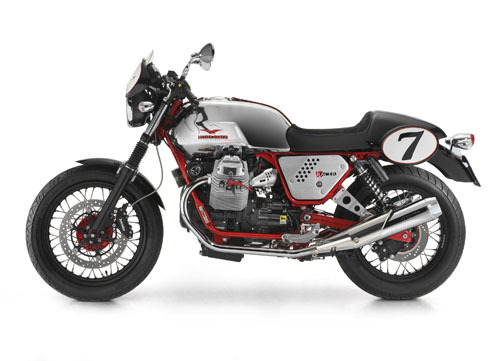 If pre-ordered from official Moto Guzzi dealers within 30th November 2010, V7 Racer + Legend Package are available at the special price of € 9,970 (Italian market only).